On July 20th of each year, folks all across the country gather to celebrate a treasure of America – ugly trucks. Since there doesn’t seem to be an actual origin of the holiday, and no real written information, it’s hard to know exactly how to observe the day. However, if I had to guess, I would say the best way is for you and your family to join your ugly truck in the driveway (or wherever you park it) and have a little party in its honor. There are all sorts of ugly trucks out there… some are ugly from the start, others have become ugly over the years due to hard driving, dents, and scratches. 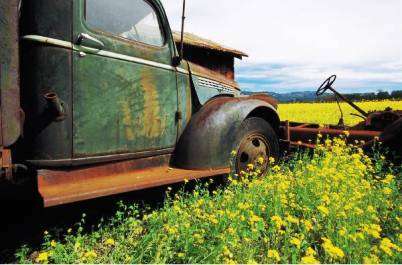 My favorite types of ugly trucks are the old farming trucks that sit in fields, clearly abandoned for years; there’s something about the sense of history they evoke that appeals to me. – Between 1924 through 1927, Dodge Brothers Company offered one 3/4 ton pickup. – The Mudflap girl gained popularity on truck mud flaps in the 1970s. – According to PickupTruck.com, “Pickup sales in 1980 fell more than 50 percent from the industry’s best year of 1978,” due to the energy crisis. Happy National Ugly Truck Day!! Since there isn’t a theme song for the day, I nominate Tim McGraw’s 2012 single, “Truck Yeah”. Sippin’ on a cold brew, hey now! This entry was posted on Saturday, July 14th, 2012 at 4:03 PM	and is filed under Misc.. Both comments and pings are currently closed.